← It’s Time To Color For A Cause! When I go to a theme park, I have to use an ECV (electronic scooter). I see a lot more of them in the parks, and a lot more near-misses and accidents. Often, this is because people don’t see you when you’re in a wheelchair or ECV. How can they miss you? Because there’s so much to look at. A theme park is a case of sensory overload, especially at the holidays. Lights flashing, decorations, brightly-colored rides and attractions all distract people walking through the park. Add to that the new park apps that have visitors looking at their phones even more than they were already, and you have a recipe for disaster. I’ve had a lot of incidents in the past. Once, a woman was backing up to take a photo, not looking behind her (where I was sitting, still, in my ECV). She toppled into my lap, glared at me, and shouted, “Watch where you’re going!” She had no idea I was there. And people abandon any of the traffic or pedestrian rules they use outside of the park. They stop suddenly, change directions without looking, cut in front of you… their brains are overloaded, overtired and overstimulated. The worst are the ones who play “chicken.” They see you, but they want to go around you, or cross in front of you, so they glance your way and dart out, not making eye contact. They don’t realize that most ECVs (especially rented ones that are often not in peak condition) don’t stop on a dime. Or a quarter. One I had was supposed to apply its brakes as soon as I quit pushing on the switch to make it go, and it did… after rolling backward about three feet. Another, when I started it, leaped forward, ignoring the speed it was set to. Yet people would run across my path, or crowd the back of the scooter, leaving me to yelp at them to get out of the way before they got hurt. Often, the are trailing their little kids behind them. Mom or dad gets clear, but the kids are lucky to escape intact. First, I added a bicycle horn. Mark and I stood around, honking horns, until we found one that sounded sort of like Harpo Marx. My horn has an irreverent, cheerful toot. Even so, many people resented it when I sounded my horn to let them know they were about to trip over me. This year, since we were headed to the parks during the holidays, I added decorations, and jingle bells. This turned out to be the magic combo. We bought plastic and tinsel wreaths from a dollar store, outdoor ribbon, and large, jangly bells, packed in my suitcase with plastic zip ties and strings of outdoor-safe, battery-operated lights. Once we picked up the scooter at the hotel, we attached all of these with zip ties, including a dangling ring of jingle bells. Whenever I needed to let people know I was there, I jingled the bells. It worked like a charm. One man, talking on his phone while walking through a crowded park, almost fell over me without noticing I was there. I jingled the bells and he looked around, spotted me, realized he was about to trip over me, and apologized. “Thanks! I didn’t even know you were there until I heard the bells!” He apologized and we parted on good terms. I made it through six theme parks without an accident. A couple of near misses from people who clearly saw me and still ran in front of me, but for the most part, it worked great. At night, I turned the lights on. People smiled when they saw me, told me how much they liked seeing the decorations. One little girl, about four years old, spotted me and grinned. “I love it!,” she told me. “I love you!” She then ran forward to show me to her sisters. I’m an introvert, so calling attention to myself non-stop for almost two weeks was exhausting. It’s like traveling with a celebrity. People said nice things, and smiled, and I smiled back, even if I was tired. It was worth it. Very few negative interactions and many positive ones. And no accidents. Did I feel silly? Sure, quite often. But I also was able to get through crowds in a reasonable amount of time, and without unpleasantness. If the choice is safety or dignity, I don’t mind looking a little silly. And it’s great not to have strangers falling on me. Makes for a much better trip. Now the bells and such are back in my suitcase, ready for next time. Happy holidays! 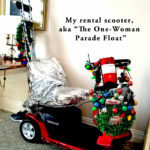 This entry was posted in Gimp On The Go, IdeaJones, Uncategorized and tagged #gimponthego, #themepark, #themeparks, #traveltips, disability, disabled, gimp, gimp on the go, IdeaJones, travel, travel tips. Bookmark the permalink.